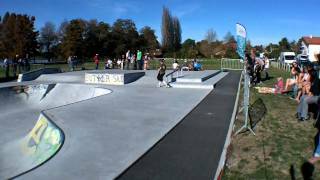 For the skaters we are pleased to announce the opening of our brand new skate park just 5 mins from the B&B, in Soustons. If skating is as important or more important than going for a surf you have come to the right place. We have a large selection of parks all within a half hour drive. The Quiksilver Europe headquarters near Biarritz have just opened a super fun massive park right outside the offices. Here we have the new fun park in Soustons , we have a park in Vieux Boucau (10 mins) ,a great park in Saubion (10mins) ,a little mellow roll around park in Le Penon (15 mins) and a few others. Because of the amount of new parks that have sprung up you can pretty much always find a quiet park to go skating. So if youwant to learn to surf in France, you may as well have a thrash around the parks as well.